Was looking to make something slightly bigger than my business card holders to put money into as well as cards and after lots of measuring and doodling have come up with this wallet! Made with some lovely jute linen fabric, open the wallet and you will see I have used a fab black on cream and cream on black polka dotted fabric to make 3 pockets.....the 2 front ones for business cards and bank cards and the back pockets for folding money. Some interfacing has also been added to give the wallet stability and body. The cream pockets have been edged with a row of machine embroidered flowers. 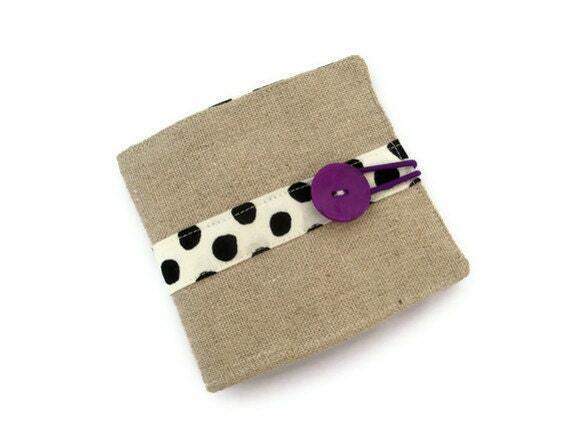 The outside of the wallet has been decorated with a strip of the black on cream polka dot fabric , the wallet closes with a pretty purple button and a purple elasticated loop.